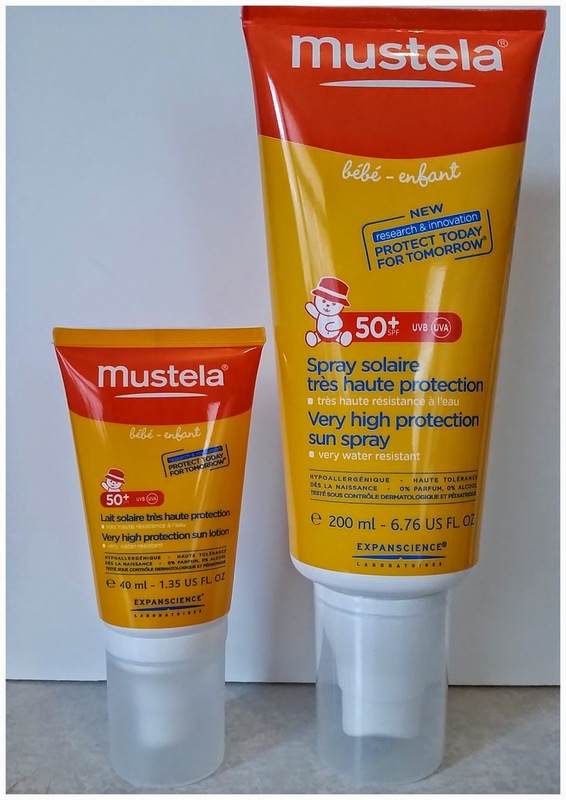 Mustela Sun Care products have been specifically designed for the delicate skin of babies and children. It's 50+ protection comes in a spray and a sun lotion. We've been trying them out over the past few weeks whilst the sun has been out, although not for long here in Brum. 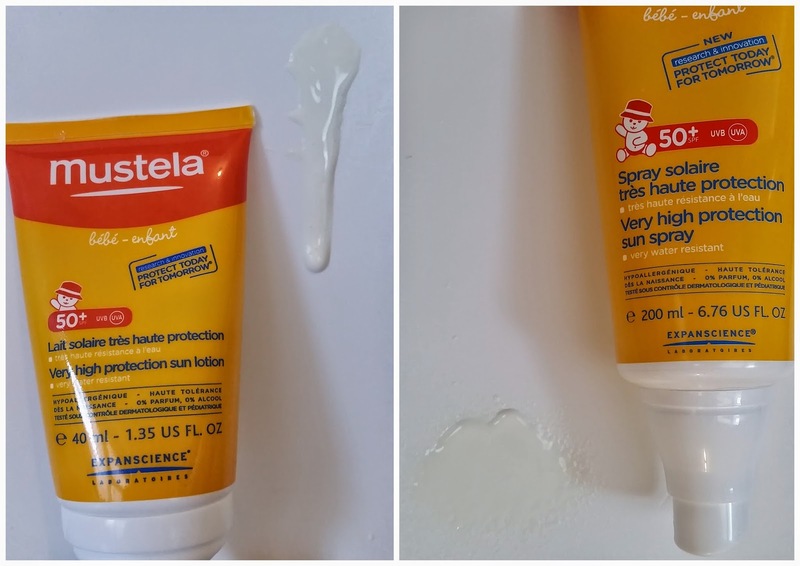 The Mustela Very High Protection Sun Spray is for the face and bodies of both babies and children. It's suitable for all skin types including atopic skin and sun intolerant skin. It has a Very high protection of SPF 50 + UVB – UVA 22 PPD. with reinforced cellular protection. You'll be happy to know that it's water-resistant and contains 0% nanoparticles. It goes on as a spray but is still nice and creamy. It's not too thick so that it rubs in easily and doesn't smell which I like. When you spray it on, it shows up as a white coloured cream so you can see where it has been sprayed making it easy to see and rub in. If you don't like using a spray to put on the sun cream then there's also a sun lotion for you too. It comes in a smaller sized bottle but applies much the same. It's a thin cream which rubs in nice and easy and doesn't really smell of anything so no bad smells. Again it's suitable for all skin types including atopic skins and sun intolerant skin. It has the exact same very high protection of SPF 50 + UVB – UVA 25 PPD as the spray and is also water resistant. The lotion is made up of the same formula as the spray, only it's in a lotion not a bottle. Both are easy to use and do what they are supposed to do as there was no sunburn here which I am happy to say as we do spend a lot of time down our local park. Out of the two I would have to say that I prefer the spray as it's quicker to apply when you're in a rush as us busy mums sometimes are. Another good thing about the spray is that it's fun. making the kids want to have a go and apply it themselves which is great. 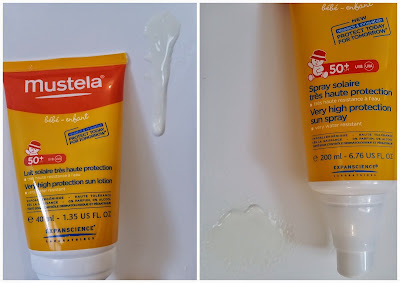 We're new to Mustela sun protection but have been pleased with it's results. Disclosure: We were sent a sample in return for an honest review. All the opinions expressed within this review are 100% honest and completely my own.